Bad Breath Test Archives - Health Issues then lick your wrist. Yes, you probably don't want to do this at your cubical or in class while others are around, but it's a great option when you don't want to ask anyone. It's important to wait for the saliva to dry for a few seconds before you smell it. Another thing you can do after lunch is grab a spoon. Head into the bathroom and scrape the back of your tongue. When you have whatever it is back there just smell it. What's it smell like? Whatever it is this probably how your breath smells to others. The back of the tongue is a huge field for bacteria and volatile sulfur compounds. You can also cup your hand over your mouth, exhale, and quickly smell what's going on in there. 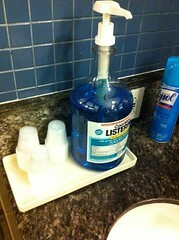 People have been using this option for years, but it's not really the most effective bad breath test out there. However, when all the others can't be administered it's definitely a good alternative. Even though a bad breath test can let you in on the overall smell, it doesn't matter unless you know how to fix it. In order to do this you have to figure out what is causing the problem and the remedies for that particular issue. For instance, if your bad breath is because of dental issues then a trip to the dentist is in order. If nothing is found it's possible that more serious health issues are the cause, which means a trip to the doctor. Then of course, dry mouth problems equal more water, while alleviating certain foods, beverages, and habits will also be important. In the end, a bad breath test is a great start. If you notice that this continues then you need to consider the fact that you're dealing with halitosis. The next step will be figuring out how to control, manage, and overcome it. There are many of us that walk around everyday with bad breath and don’t even realize it. Some people just can’t smell it because they smoke or have sinus issues, while others worry about it but don’t know how to administer a bad breath test. Today we want to help you keep your breath smelling great, and knowing whenever it needs a little work. Some of these ideas might be a little embarrassing, but they’re well worth it. The first one is simply asking your spouse or loved one. These individuals already know about your flaws, so one more isn’t going to be a big deal. Just ask them to take a whiff and it will be an effective bad breath test. The next option is scheduling a dentist appointment and asking him or her. We highly recommend doing this if you’ve been experiencing chronic bad breath. You shouldn’t feel embarrassed about asking your dentist since it’s their job. However, listening to the lecture afterwards might be a little embarrassing. If you need to perform a self-administered bad breath test then lick your wrist. Yes, you probably don’t want to do this at your cubical or in class while others are around, but it’s a great option when you don’t want to ask anyone. It’s important to wait for the saliva to dry for a few seconds before you smell it. Another thing you can do after lunch is grab a spoon. Head into the bathroom and scrape the back of your tongue. When you have whatever it is back there just smell it. What’s it smell like? Whatever it is this probably how your breath smells to others. The back of the tongue is a huge field for bacteria and volatile sulfur compounds. You can also cup your hand over your mouth, exhale, and quickly smell what’s going on in there. People have been using this option for years, but it’s not really the most effective bad breath test out there. However, when all the others can’t be administered it’s definitely a good alternative. Even though a bad breath test can let you in on the overall smell, it doesn’t matter unless you know how to fix it. In order to do this you have to figure out what is causing the problem and the remedies for that particular issue. For instance, if your bad breath is because of dental issues then a trip to the dentist is in order. If nothing is found it’s possible that more serious health issues are the cause, which means a trip to the doctor. Then of course, dry mouth problems equal more water, while alleviating certain foods, beverages, and habits will also be important. In the end, a bad breath test is a great start. If you notice that this continues then you need to consider the fact that you’re dealing with halitosis. The next step will be figuring out how to control, manage, and overcome it.